Roller Derby is coming to the Jackson Area YMCA! A bout between the host Silver Bridge Bruisers and Central Ohio Roller Derby is scheduled for Saturday, April 13 at the Jackson Area YMCA. The “first whistle” will be at 5 p.m. The Gallipolis-based Bruisers have some Jackson County women on their roster and have conducted practices at the Cavalier Roller Rink in Jackson, but have never hosted a bout in Jackson County. Tickets cost $12 each and only a limited number remained as of early this week. A portion of the proceeds will go to benefit the Special Olympics program. If you can’t make the April 13 bout, other home bouts at the YMCA have been booked for Saturday, Aug. 17 against the Glass City Rollers and for Saturday, Oct. 19 against Athens Ohio Roller Derby. Check out an upcoming edition of The Telegram for more information about the Silver Bridge Bruisers and the April 13 bout. 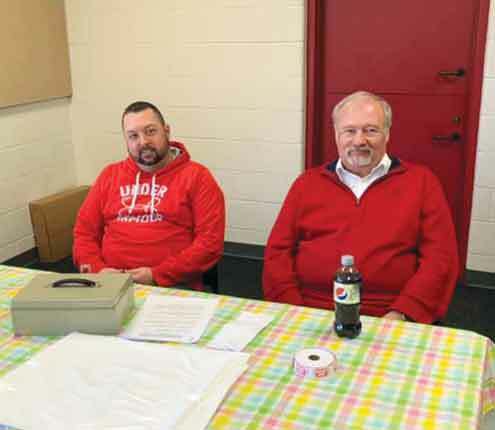 In recent years, the Oak Hill Area Chamber of Commerce has had a presence at the Spring Showcase and that was the case again this year with President Kurtis Strickland, Vice President Bruce Barkhurst and Secretary Sandy Borden all taking turns in the Chamber’s booth. The Oak Hill Chamber will once again conduct its annual Yard Sale and Amish Business Showcase on Saturday, June 1, at Aetna Park on Front Street in Oak Hill. The Yard Sale, which is scheduled from 8 a.m. until 2 p.m., allows community vendors to rent spaces in the garage for $10 or in the grass for $5. The Amish Business Showcase is set for 10 a.m. until 2 p.m. and will enable the Amish to showcase and sell their products in one location. Those interested in reserving a selling space should call 740-418-3649. By the way, Jackson Lake State Park near Oak Hill will be a busy place throughout the spring, fall and summer with the first event to be an Easter Egg Hunt at 2 p.m. on Saturday, April 13. On Saturday, April 27, the public is invited to participate in a Cleanup Day at the park from 10 a.m. until noon. Another red-letter day on the park schedule is a concert by Open Rail on Saturday, Sept. 28, starting at 6 p.m. The Buckeye Hills Career Center was also represented at the Spring Showcase and Training and Development Coordinator Jamie Conway was among the representatives on hand to share information about offerings for adults. Conway reported that there is a lot of excitement and interest about a new adult-education course which is designed to educate students to be employed as power linemen. Other existing adult courses cover such diverse fields as health, manufacturing, the construction trades, robotics, welding, computer engineering, transportation, early childhood education, cosmetology, culinary preparation, criminal justice, cyber security, agribusiness, information technology, and marketing. Conway was working the adult side of the Career Center, but he also said that interest in vocational education at the high school level is also on the rise. Anytime Fitness, located at 534 E. Main St. in the Jackson Square Shopping Center, is also about to spread its wings. Although details won’t be announced until later, Marketing Director Janet Crabtree confirmed that a major expansion will take place within a year, which will greatly increase the size of the facility. Dr. Brian Morris and wife, Jamie, of Southern Ohio Smiles are justifiably excited about their dental office’s latest service -- mini dental implant placement and restoration. Mini dental implants are an option for patients looking to replace lost teeth but who don't want (or can't receive) conventional restorations. Some people don't want the invasive surgery required for regular implants, whereas others lack the bone mass in their jaws to hold them. Many consider mini dental implants a more comfortable and more affordable alternative to dentures and implants. Dr. Morris said the response has been very positive thus far and it appears Southern Ohio Smiles is ahead of the curve as his office is the only one offering mini dental implants between Zanesville and Cincinnati. Southern Ohio Smiles is located at 41 E. South St. and both Dr. Morris and his wife are Jackson High School graduates who chose to come back to their hometown to practice dentistry.